I almost always do research on food when we’re travelling. But this time around I haven’t really been doing much. Maybe it’s because the Tokyo map system is a little crazy, or maybe because it feels incredibly freeing to not have a place that I must eat at. Either way, I’ve been enjoying the casualness of this trip a lot more than some of my crazier trips where I’ve planned breakfast, second breakfast, lunch, dessert break, dinner and after dinner. This time around I’ve been taking a back seat to it all and been wandering around in a daze and going places that Mike’s found. 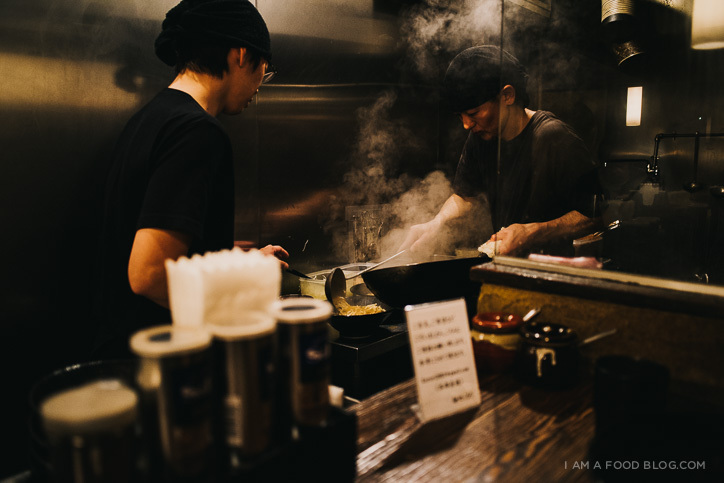 We’re both huge ramen fans and when he found a joint purporting to be the best miso ramen in Tokyo, we both decided that we had to go. 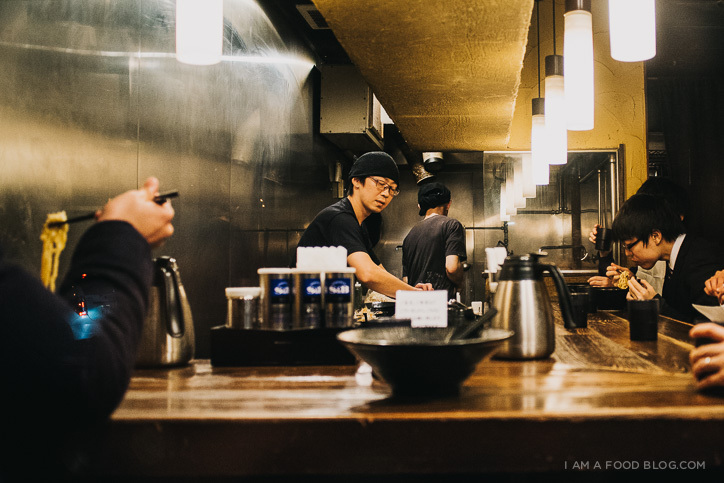 Kururi is a tiny 7 seater counter wrapped around two ramen chefs. The exterior is unassuming and simple. So simple in fact, that it doesn’t have a sign, just a black board. Don’t worry though, you’ll know you’re there when you see the line of people patiently waiting for their bowls of bliss. We got there on a quiet weeknight and then line was only 6 deep so the wait was pretty short. We joined the line, and when the ramen chef gestured us in, we went to the machine and selected our bowls. 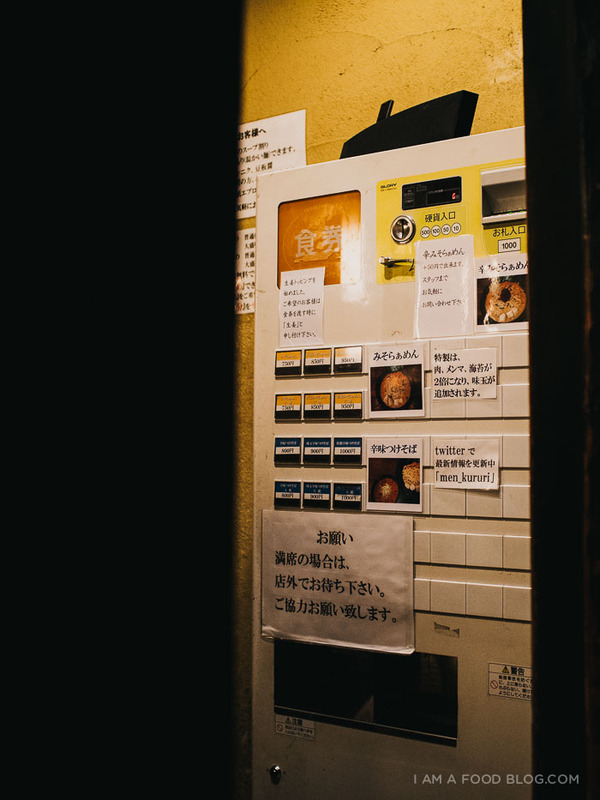 Like most ramen joints, you order from a machine. Some machines have pictures and some don’t, but generally, I’d say that the top left hand button is what the shop is known for. You put your money in, push the buttons and hand the little ticket to the chef, then go back outside and wait for your seat to open up. When we sat down, the chef handed us coupons for free eggs for the next time around. I was pretty excited because: free eggs! It’s my dream to have ramen with multiple eggs. I could just order six eggs for my bowl, but I think that I’d get a couple of weird looks. One of these days I’m going to do it though. I’m obsessed with ajitsuke tamago – those marinated soft boiled eggs you find gracing so many delicious bowls of ramen. I didn’t order an egg with my ramen, but Mike gave me his (that’s true love, right there!). The egg was delicious, but even more so was the broth. 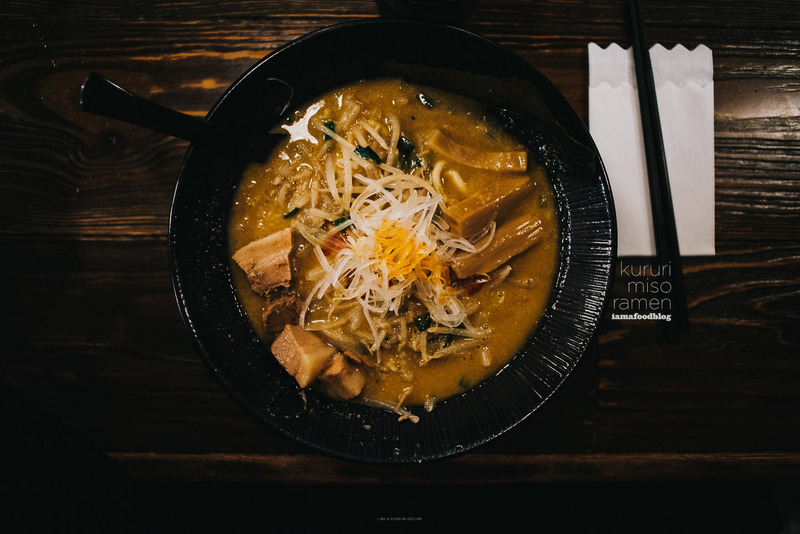 If you’re a fan of miso ramen, you’ve got to give Kururi a try. 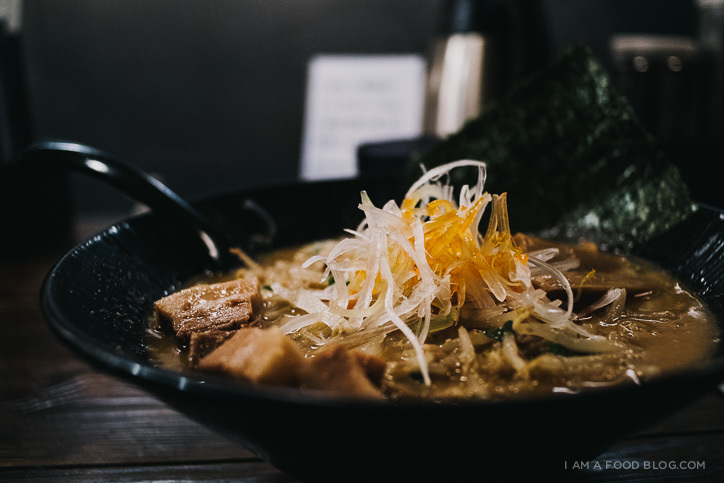 They custom mix a bunch of different miso pastes together to create a deeply delicious thick broth that is incredibly addictive. Bathing in the rich salty sweet broth are thick and hearty noodles, tender pork chashu, and an optional soft boiled egg. The heft of the noodles plays well with the broth, which is almost gravy-like. Toppings include onions, bean sprouts, bamboo shoots, a orangey-red chili oil, and two sheets of nori. I had pretty high expectations going in and usually that results in disappointment, but this time, I’ve got to agree: this is one of the best bowls I’ve had in Tokyo. Head North out of the station and cross the river. Turn right (East) for about five minutes. There isn’t a sign, but there’s usually a line up. The exterior is the first shot in this photo series. That looks absolutely delicious. 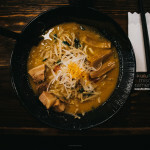 I lived in Japan for about a year and miss ramen horribly. I, like you, want 6 eggs with my ramen. Ajitsuke tamago are the best. Have you tried to make them before? I haven’t, but it’s definitely something that I would love to do. Hope you keep enjoying delicious food in Tokyo!!! I can only imagine what this tastes like. The colors just look like they are packed with goodness! Thank you for sharing these little stories about Tokyo! Gah! That looks absolutely incredible. Your tips are so great. I’m jotting them down in case I ever end up in Tokyo. I’ve heard that true Japanese miso can’t be in any way compared to what we’ve got in the States. I can only imagine, then, what heaven this bowl must be. That’s so crazy that you order and pay through a machine. Kinda cool though. Ramen looks delicious! Drooooling. Also, I love your food research on trips — ME TOO! But so glad that this trip can be a little more relaxing and free-form for you :) Judging from this insane bowl of ramen, it’s still serving you pret-ty darn well. I am taking so many notes for whenever I make it to Japan!! 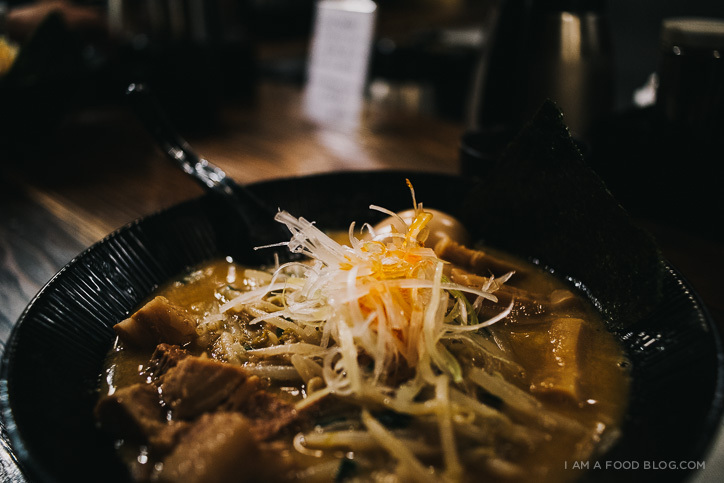 The weather is cold and dry, plus it’s been raining, too…and I totally need this ramen…as of this minute. Yum! I am sooooo envious. How fun. Really fun. Plus the food looks completely over the top. Thanx for sharing. It was a fun post. Looks delicious, but definitely Gogyo, with their flaming kogashi ramen is hands down the best I’ve ever had in Japan. It sounds like you travel the same way I do – food and restaurants are always my number one priority. As soon as we’ve eaten lunch I’m thinking about what we’re going to have for dinner. My husband and I are just finishing a big South America trip so I think things will be a bit quieter on the travel front for the next little while, but I am dyyyying to go to Japan and just eat my way through it as I’m obsessed with sushi and ramen and Japanese food in general. I’ll get there one of these days! Dying. This looks so so amazing. I’d totally be right there with you eating six eggs in my ramen–talk about heaven in a bowl!!! Love that you’re loosening up your restaurant homework and still finding totally awesome places!!! Man do I miss ordering ramen from a machine!! I actually just miss ramen from Japan, period. That miso ramen looks pretty perfect. Drooling about it right now. P.s. I love that you typically plan second breakfasts!! This is one of the many reasons we are friends! I think kururi is okay but nothing special. On my list of best miso ramen shops it doesn’t crack the top ten. 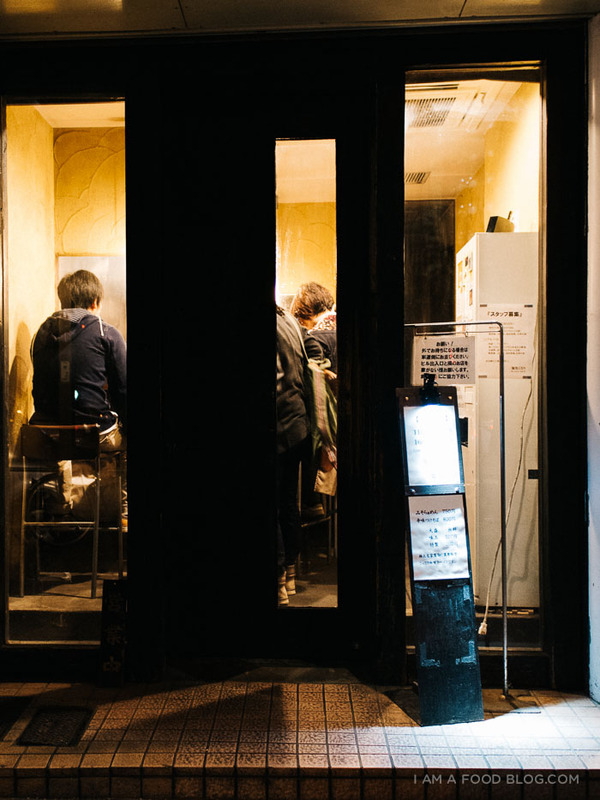 I live a 20-minute walk from this place, and I can vouch for the praise — it’s the best miso ramen in Tokyo. It’s the best ramen period. Oh no! I’m going to Tokyo next week and am researching ramen places. This place looks amazing so I looked it up on google maps, and it says that it’s permanently closed!!! Say it isn’t so !